You will have an opportunity to apply your leadership, communications, organization, facilitation, and project management skills through direct engagement in the Good Festival initiative. The Good Festival aims to discover and celebrate artists, entrepreneurs, scientists, writers, filmmakers, and other “doers” who are building a better world. The initiative has grown rapidly and is currently one of the biggest exhibitions of “good” products, services, and innovations, aligned with the UN Sustainable Development Goals. This is not only about adding value to others through a practical application of your skills. Rather, it’s about joining a thriving community of like-minded individuals who are united by a genuine desire to make a difference. 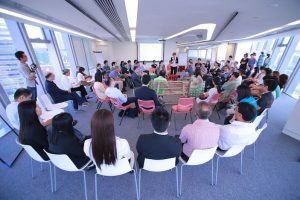 The “collaboratory” is an open-space, creative method for hosting meaningful conversations where various stakeholders tap into the collective intelligence to generate solutions to complex problems. The idea originates from the visioning work of a large group of people – including scholars, artists, consultants, students, activists, and other professionals – who worked together on the 50+20 initiative aiming at radically transforming management education. You will have the opportunity to engage in collaboratories on various relevant topics. In a collaboratory, you will discuss and exchange ideas with students, practitioners in business and civil society, researchers, and stakeholders – because interdependence is key to tackling issues for the common good. You will not only learn through direct exposure to cross-functional thinking and multi-stakeholder approaches, but you will also have the chance to develop new skills through supplementary training on organizing, hosting, and facilitating collaboratories.